Believe it or not: New York City’s industrial laundries aren’t like the Laundromat on your block. Industrial laundries are large factories that wash the napkins you use at restaurants, the gowns you wear at the doctor and the sheets you sleep on at hotels. Many of these factories have hundreds of workers handling hundreds, even thousands, of pounds of soiled linen a day. That’s why I’m excited about the CLEAN ACT recently unveiled by New York City Councilmembers Ritchie Torres and Dan Garodnick. This bill would help our city’s worst employers clean up their acts through regulation and licensing, making all the linen we use safer. The CLEAN ACT would authorize new standards of cleanliness for industrial laundries and for laundry delivery trucks, which would improve the quality of industrial laundry jobs and prevent contamination of linens used by hotels, hospitals, restaurants, and other businesses. Industrial laundries would be required to be licensed and regulated by the city’s Department of Consumer Affairs (DCA), in a way similar to how retail Laundromats and dry cleaners are treated. The CLEAN Act would also help end the exploitation of low-wage immigrant workers employed by industrial laundries. Too many laundry workers work for low wages and no benefits. We are often exposed to fabrics with bodily fluids, chemicals that can burn our skin, and hazardous machinery. It’s critical that laundry owners provide their employees with a safe environment and don’t pressure workers to process linen in an unsafe manner. I am blessed to have spent the last five years working for a responsible laundry facility in the Bronx. Where I work, we are organized in a strong union and we can stand up for what we need. In far too many laundry facilities, managers value speed more than safety and more than quality. Many laundry workers are left vulnerable to on-the-job injuries and possibly death. 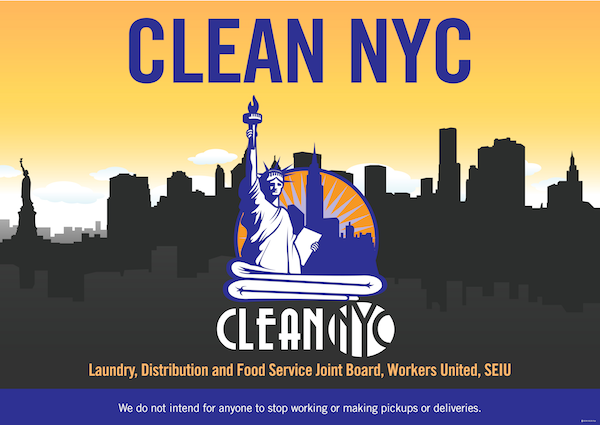 I believe the CLEAN ACT is a step in the right direction for cleaning up New York City’s industrial laundry industry for workers and the public. After all, the only dirt workers in our industry should have to deal with is laundry.